Wellcome Trust APCs: Towards a New [Open Access] Serials Crisis? “In an attempt to make the debate around the costs of open access publishing more evidence based”, the Readme file (14th March 2013) signed by Robert Kiley says, the Wellcome Trust released into the public domain a dataset including details of its open access spend in 2012-2013, “as reported by UK institutions and the Trust’s Major Overseas Programmes in receipt of an OA block grant“. 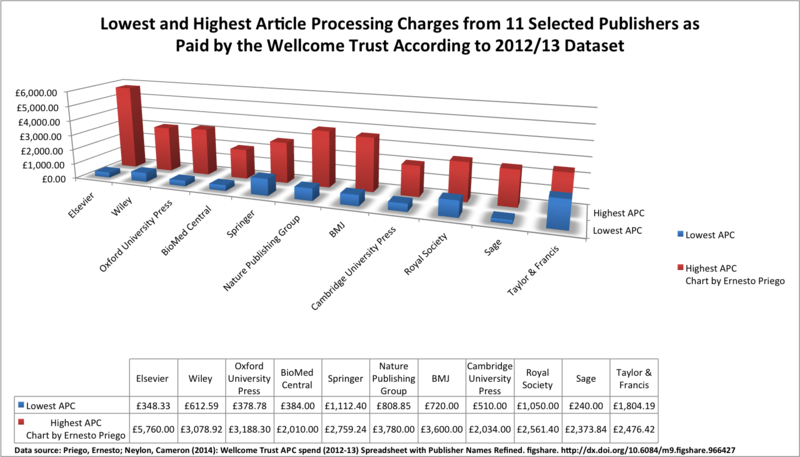 Neylon, Cameron (2014): Wellcome Trust Article Processing Charges by Article 2012/13. figshare. The Wellcome Trust datatset only includes information when an APC was levied. It includes a column for the name of the publisher, as reported by the institution. As the Wellcome Trust does not impose any name authority control on this field, the same publisher was listed in different ways, including typos, acronyms, joint publisher names, etc. For example, there would be OUP, Oxford University Press, and O.U.P appearing and counting as different publishers. These publisher name inconsistencies were still present in Cameron Neylon’s version of the data as cited above. I wanted to focus on a few major publishers, and in order to filter them I had to refine the Publisher names inconsistencies a bit. I worked with Cameron Neylon’s version of the dataset and manually refined inconsistencies in the Publisher field (same publishers appeared under different names and spellings and other text formatting issues). I did not refine the journal titles. I have been looking at that spreadsheet, which reflects the manual refining of the Publisher field I did. As I also tried to explain in my previous post, this ‘refining’ is the result of a human interpretive process, and some of the publisher names that are distinct in that dataset might still be potentially subsumable to other publisher names in the set. Logically, the number of publishers and costs and outputs associated to each publisher will depend on how the Publisher field has been refined; other quantifications and visualisations of the original dataset or other versions that have been refined differently are therefore likely to differ. After refining the number of publisher names to 101, I focused on 11 publishers from the dataset and obtained totals as well as their maximum and minimum APCs. I am interested in focusing our attention on the highest and lowest APCs that these 11 publishers levied. I believe they offer a glimpse of the average cost of “Open Access” as currently charged by major academic/scientific publishers. I use scare quotes because most of these publishers (if not all?) do not generally publish born-Open Access journals but so-called “hybrid” journals– that is, traditional subscription-based journals that permit authors –ideally via their funders– to pay a fee to make their article available “Open Access”. [Disclaimer: someone still needs to go journal by journal in the dataset to determine as fact which ones are hybrid journals; I haven’t done this yet]. Different publishers call this option differently (for example Springer’s Open Choice or Taylor & Francis’s Open Select). Whether all these “Open” options clearly offer open licensing allowing not only access in terms of viewing but in terms of reuse still needs to be investigated thoroughly. As shared in my previous post, the following bar chart visualises the lowest and highest APCs levied by these 11 major publishers (click to enlarge). Why do I think it’s important to focus on these figures? To create awareness through evidence of the price scale of the “Open Access” options offered by hybrid journals from major publishers as paid by the Wellcome Trust (a forward-thinking institution pioneering in their support of Open Access; for their OA policy, go here). To create awareness of the prevalence of at least three of the publishers, indicating that many scientists still favour them with their work. It is a truism that “Open Access” was developed in part as a response to “the serials crisis” (on the term, see for example Panitch and Michalak 2005). Major or “legacy” publishers that traditionally have based their business model on institutional subscriptions (toll or paywall) have reacted to Open Access government and institutional mandates by offering “Open” options through Article Processing Charges. However, these figures reveal what to me at least appears as a mere inversion of the business model, reliant on academic outputs for which considerable funding and/or financial means seems to be taken for granted. The high prices charged to libraries in the paywalled model seem to have been shifted now to the researchers through, ideally, their funding agencies. It is very important these observations are not misinterpreted as a knee-jerk reaction against all APCs. I edit a journal that charges an APC (and offers its complete waiving as well). Publishing costs money. Enabling Open Access costs money. But does it cost as much as reflected by the APCs in the Wellcome Trust dataset? That is the question. On the one hand I hope having some awareness of the current hybrid journal APCs charged by major traditional publishers helps provide a point of reference where to judge the current APCs charged by born-Open Access, researcher-led journals like the ones published by Ubiquity Press and other innovative publishers. On the other hand, I believe it is time for those of us involved in enabling Open Access to refine our critical engagement with the term and the current publishing landscape. The average of all APCs (excluding the £13,000 one for a Palgrave book) in the Wellcome Trust dataset is £1820.01. There is an APC payment for what appears as a single article of £6000. If only all research funders were like the Wellcome Trust. With these rates, who is being excluded from Open Access publishing as currently implemented by the major publishers in scientific/academic publishing? Arts and Humanities research cannot possibly compete. Aren’t we clearly rushing towards a new “OA serials crisis”, where publishing is still dominated by the same major publishers who partly led to the serials crisis in the first place? Many more questions remain to be asked. Let’s start with those above.